Style points are not so important during the second half of the college football season. Just win, baby, as the late Al Davis famously said, and the Top 25 voters will likely reward a team. Or at least they won’t punish. This past weekend things got a little crazy around the country, with four of the top eight teams in last week’s rankings losing. This on the heels of three top-10 teams going down in week six. The last two weeks, 16 ranked teams have lost. Winning is hard and with all this losing going on, getting hung up on less-than-lovely performances doesn’t make much sense. 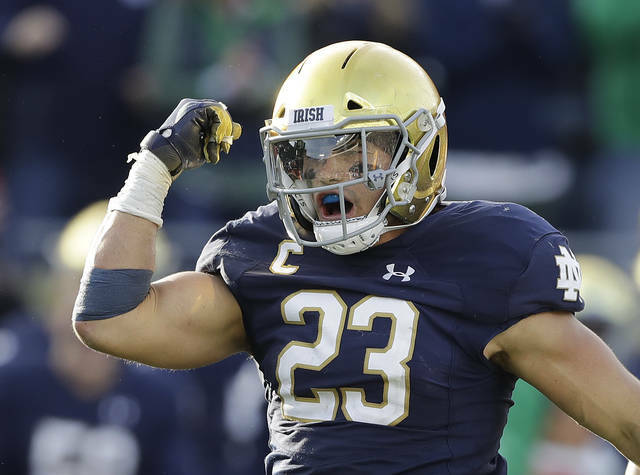 Ohio State, Notre Dame, Texas, Central Florida and Florida all had their issues on Saturday, but they all won and none dropped in the rankings. Expect it to be that way going forward. The exception could be if a team scores a particularly big victory that causes some re-arrangement above its previous ranking. If one team goes way up, others have to come down. And vice versa, which explains why several teams that did not play this past weekend ended up better positioned Sunday. Heat Check considers how the voters did after another shake-up that left the FBS with only eight undefeated teams. With a trip to LSU on the horizon (Nov. 3), and an open date after playing the Volunteers, it might be a good time to get QB Tua Tagovailoa’s balky knee some rest. The last two seasons with Jalen Hurts starting at quarterback, Alabama has beaten the Vols twice by a combined 94-17. More concerning for the Buckeyes: A defense ranked 75th in the nation (5.62 yards allowed per play) or a running game ranked 66th (4.48 yard per carry)? Heat check: Buckeyes finally reach No. 2 and now it doesn’t look as if they actually belong there. Too hot. Next: vs. 16 North Carolina State. The Tigers have had a few tricky spots, but their fundamentals seem healthy. No. 3 nationally in defense (3.97 yards per play) and No. 5 in offense (7.51 ypp). Heat check: Too cold. Should be two. Heat Check is a believer in the premise that if the main reason you think a team will go undefeated is its schedule that team will not go undefeated. The Irish seem like that type of team. Very good, but not good enough to avoid a slip up somewhere. Heat check: Little too hot. Next: vs. No. 22 Mississippi State. Sure the victories against Miami and Auburn have been devalued, but still the Tigers have played the toughest schedule in the nation among highly ranked teams. Sixth-best in Division I, according to the Sagarin computer ratings. Heat check: Too cold, should be four. Maybe three. Next: at No. 24 Michigan State. It could be argued that Michigan is the most complete team in the Big Ten right now. Next: at Oklahoma State, Oct. 27. 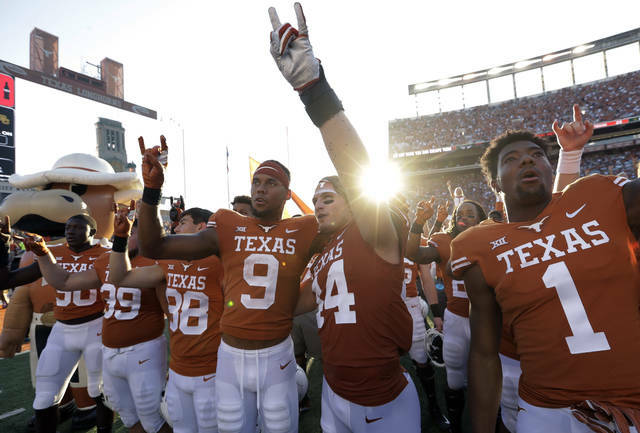 Good time for a week off: QB Sam Ehlinger has a sprained throwing shoulder and the Longhorns sputtered without him against Baylor. Next: vs. No. 11 Florida, Oct. 27. Georgia wants to be Alabama. Well, the Bulldogs’ last two losses have been by 23 and 20 points. In 11-plus seasons under Nick Saban, the Crimson Tide has never lost a game by more than 14 points. Can newly promoted coordinator Ruffin McNeill bring some stability to the Sooners’ defense? The Knights responded to their first challenge of the season, and deserved better than status quo from the voters. Next: vs. No. 8 Georgia, Oct. 27. An offensive line that has underachieved plenty in recent years has played much better under assistant John Hevesy. Heat check: Too hot, should be behind Kentucky. Next: at No. 25 Washington State. The Ducks lack a big, bruising back, but at 5-foot-9 and 201 pounds, redshirt freshman CJ Verdell runs with power and a lot of punch. Next: vs. Baylor, Oct. 25. Heat Check has been skeptical of the Mountaineers hype since preseason, and losing at Iowa State was a very West Virginia thing to do. At this point, with Auburn out of the way, Heat Check endorses using head-to-head matchups to sort out Florida, Kentucky and Texas A&M. The Huskies are 107th in the country in converting red-zone trips into touchdowns (54.29 percent) and it is the biggest reason for their two losses. Freshman TB Ricky Person has given the Wolfpack a much-needed boost on the ground with 200 yards on 31 carries in the last two games. Next: at Mississippi State, Oct. 27. JUCO transfer Jace Sternberger is having an All-America season, leading tight ends in FBS with 496 yards receiving and six touchdowns. The Nittany Lions can only hope they can respond to this year’s consecutive close losses to Ohio State and Michigan State as well as last year’s. Nate Stanley has been the Big Ten’s best quarterback not named Dwayne Haskins over the last four games, with 14 touchdown passes and three 300-yard games. Heat check: A bit too hot, but should have been ranked a week ago. Bearcats were another one of those teams that capitalized in an off week, moving up five spots. That seems a bit much for a team that is questionable to be ranked at all. The Bulls have four victories by 10 points or fewer. Next: vs. No. 5 LSU. The Bulldogs still have a chance to play spoiler in the SEC West. Could easily have dumped Wisconsin this week, but that victory at Iowa still looks pretty good. Heat check: Too cold. Ahead of Iowa. Next: vs. No. 6 Michigan. As usual, when you’re about ready to write off the Spartans and coach Mark Dantonio, they pull out an unlikely victory. Michigan State has 11 victories against ranked teams since 2013, trailing only Alabama (14) and Ohio State (11). Heat check: Too cold. Ahead of Penn State. Next: vs. No. 12 Oregon. ESPN’s “GameDay” is finally coming to Pullman, Washington, — which has nothing to do with the Cougars’ ranking, but is pretty cool. Should be out: Cincinnati, South Florida, Mississippi State. 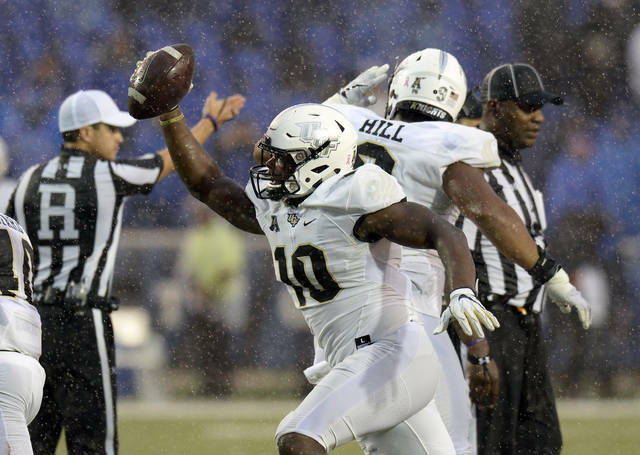 Should be in: Time to start rewarding some other Group of Five conference teams such as Appalachian State, Utah State and Fresno State.